Put the flour, ****er, milk, egg, and parsley into a bowl. Get out a large mixing bowl and put 1 1/2 cups (187 g) of self-rising flour into it along with 3 tablespoons (42 g) of melted ****er, of milk or ****ermilk, and 1 beaten egg. For a fresh herb flavor, add 1 tablespoon (4 g) of chopped fresh parsley. If you don't have ****er, you can substitute vegetable shortening. Mix the ingredients into a soft dough. Stir the dumpling ingredients until the flour absorbs the ****er, milk, and egg. Then use your hands to gently knead the dough until it comes together into a ball. 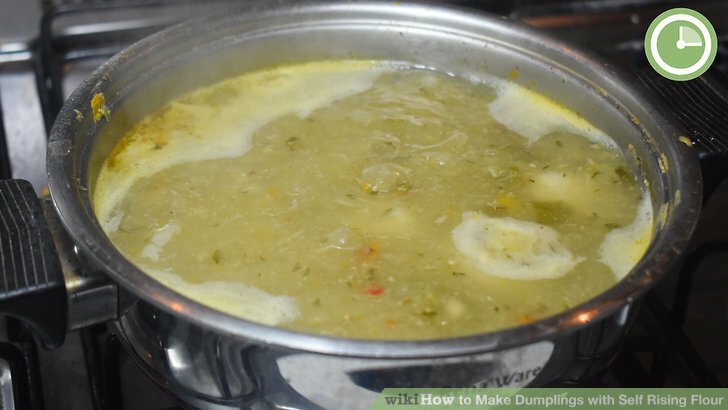 Lay the dumpling squares in a pot of hot soup or broth. Heat at least of hot soup or broth in a large pot on the stove. Place the dumpling pieces on top of the soup. You'll probably need to overlap the dough pieces a little to get them to fit in the pan. Scoop the dumpling batter into a pot of hot stew or broth. Heat a pot of stew, soup, or broth over medium heat. Then use two spoons or a small cookie scoop to drop a mound of dumpling batter onto the hot liquid. Continue dropping the batter until you've used it all and the top of the liquid is covered with dumplings.